The superstar was an exciting 8-year-old Indoctro gelding out of a Darko mare when we imported him back in late-2009. Vedor was World Champion Six-Year-Old in Europe prior to being tried by Julia at Stal Tops, where the pair instantly clicked. 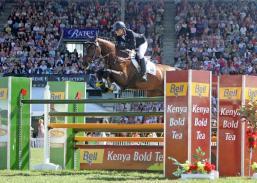 A small syndicate was put together to buy the horse, with a view to aiming for London 2012. In 2010, Julia and Vedor were ready for competition, and demonstrated their metal by winning the Mini Prix at Castle Hill Show, the only horse to go double-clear out of a tough and experienced field. Vedor then won the Grand Prix at Hawkesbury Show, just to prove it wasn't a fluke. The pair made their debut at World Cup level at Adelaide Royal in September, finishing 5th after going clear both rounds but with a few time faults. More placings at World Cup continued, culminating in a great win at Sydney Royal in 2011. Vedor was also a member of the successful Australian team at Horse of the year show in New Zealand in March. Julia moved to Europe with Vedor in June 2011, aiming to consolidate their growing skill base. They performed well enough in the selection trials at Lummen and Bourg-en-Bresse in May and June 2012 to guarantee them a spot on the team, and their performance at Greenwich in August was outstanding. It is rare to see a rookie pair make it through to the Individual Final, but they did, and made Australia proud.